A reliable IP phone for small business users, the GXP1625 delivers a suite of powerful VoIP features in an easy-to-use fashion with a modern design. The GXP1625 offers support for up to 2 lines and features full HD audio on both the speaker and handset to allow users to communicate with the utmost clarity. Additional features include 3-way conferencing to maximize productivity, 3 XML programmable soft keys for customization and EHS support for Plantronics headsets. 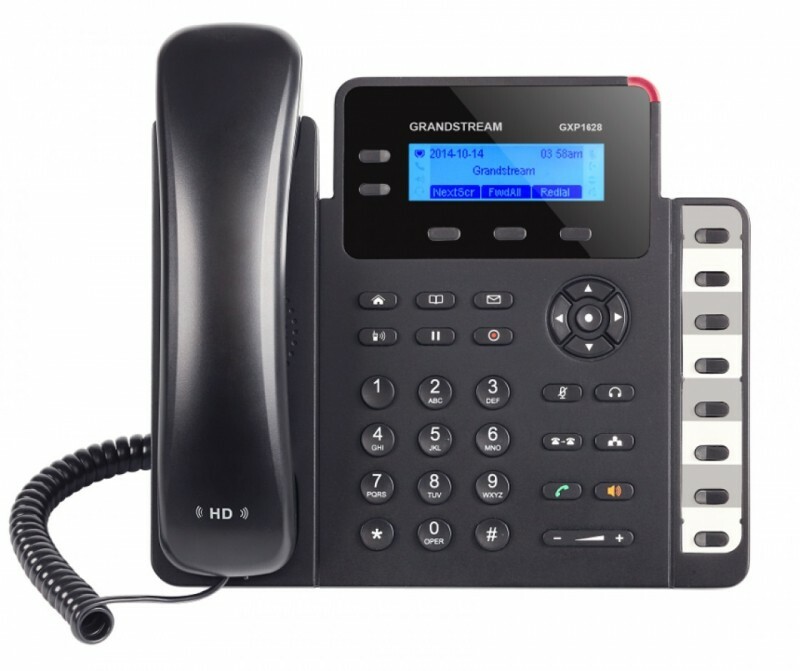 These features allow the GXP1625 to be a high-quality and easy-to-use small business IP phone. 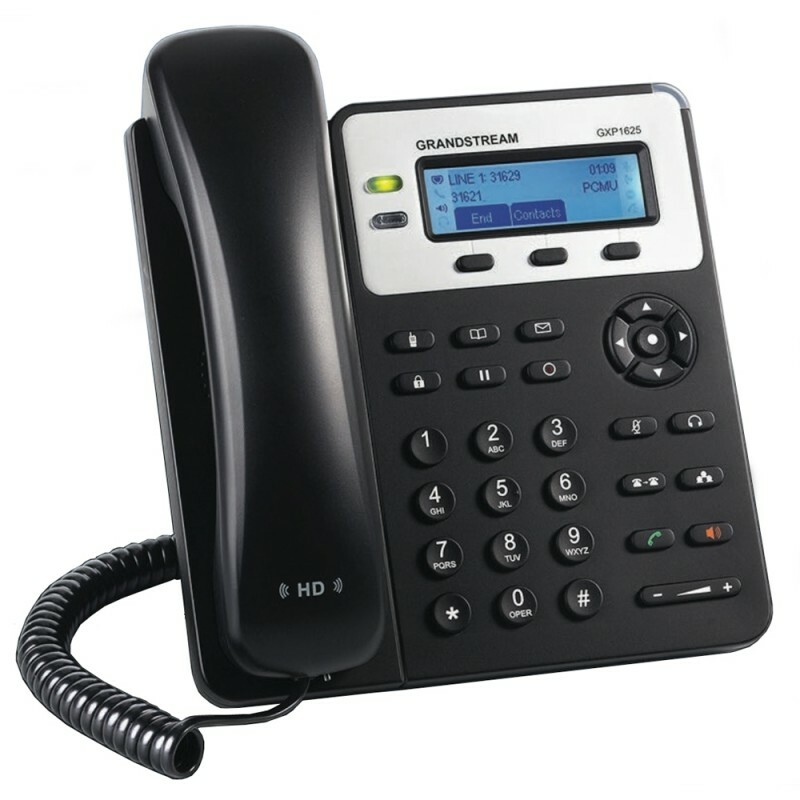 As all Grandstream IP phones do, the GXP1625 features state-of-the-art security encryption technology (SRTP and TLS). The GXP1625 supports a variety of automated provisioning options, including zero-configuration with Grandstream’s UCM series IP PBXs, encrypted XML files and TR-069, to make mass deployment extremely easy. A high-end IP phone for small business users, the GXP1628 delivers a suite of powerful VoIP features in an easy-to-use fashion with a modern design. The GXP1628 offers support for up to 2 lines and features Gigabit ports to maximize connection speeds and call quality. The phone includes 8 BLF/speed dial keys that allows users to easily monitor presence and status of other extensions and transfer calls. 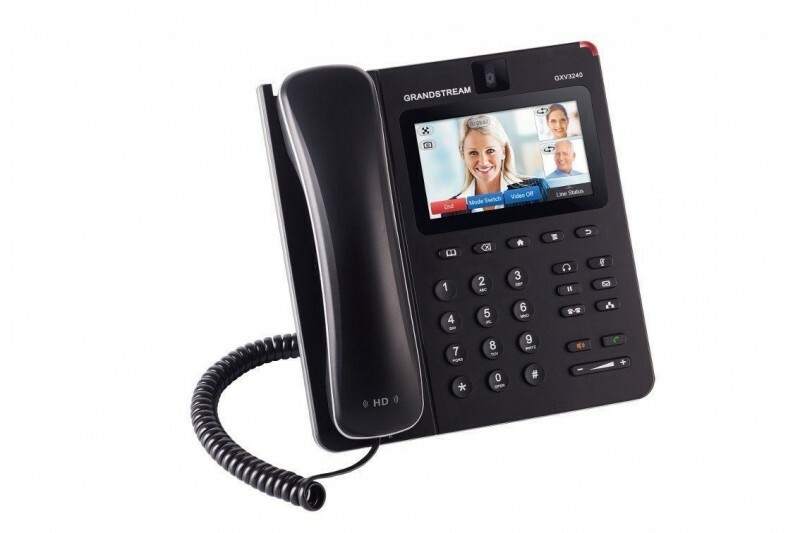 Additional features include HD audio for crystal-clear calls, 3-way conferencing to maximize productivity, 3 XML programmable soft keys for customization, EHS support for Plantronics headsets and integrated PoE to allow one cord to power the phone and give it a network connection. These features and more allow the GXP1628 to be a high-quality and versatile small business IP phone. 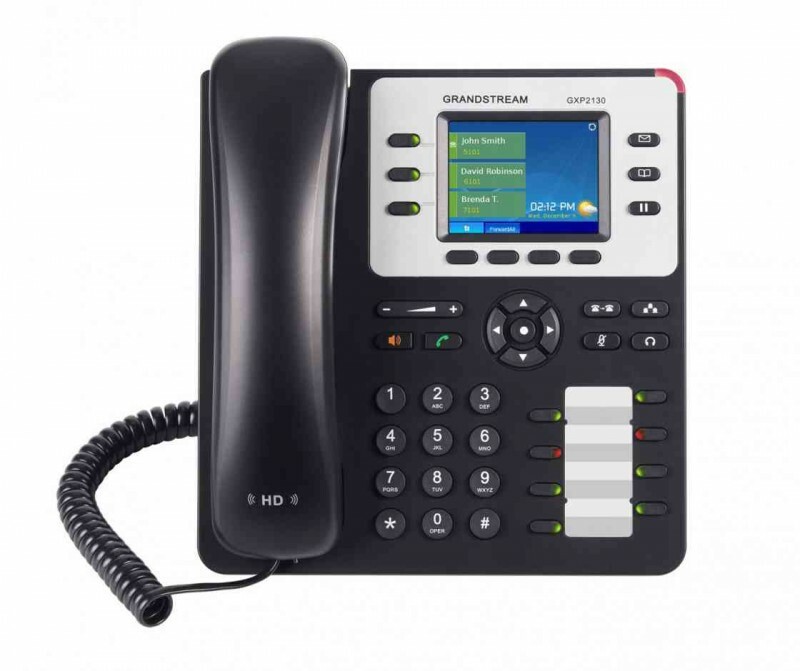 The GXP2130 v2 is a Linux-based device with 3 lines, 4 XML programmable soft keys for customization and 4-way voice conferencing to keep business users in-touch. It includes 8 BLF/speed-dial keys to allow users to easily monitor presence and status of other extensions and transfer calls. HD audio and a 2.8" color LCD screen create high quality calls and built-in Bluetooth support allows for use of Bluetooth headsets and transferring of phonebook and calls from paired mobile devices. This Enterprise IP phone also features Electronic Hook Switch support for Plantronics headsets. The GXP2130 v2 is perfect for small businesses, SOHOs and enterprises looking for a high quality IP phone with comprehensive features that is easy-to-use. 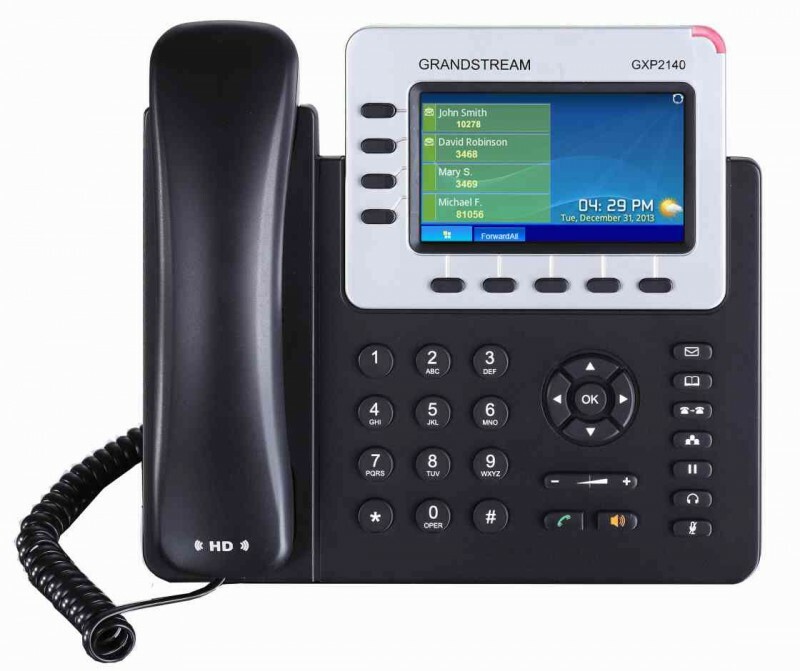 The GXP2140 is a Linux-based device with 4 lines, Gigabit ports to guarantee the fastest possible connection speeds, 5 XML programmable soft keys for customization and 5-way voice conferencing to keep business users in-touch. By being compatible with Grandstream’s GXP2200EXT extension module, the GXP2140 can offer users up to 160 speed-dial/BLF keys by combining up to 4 GXP2200EXTs to easily monitor presence and status of other extensions and transfer calls. HD audio and a 4.3" color LCD screen create high quality calls and built-in Bluetooth support allows for use of Bluetooth headsets and transferring of phonebook and calls from paired mobile devices. This Enterprise IP phone also features Electronic Hook Switch support for Plantronics headsets and a built-in USB port. The GXP2140 is perfect for Enterprise & SMB customers with the need for quality and versatility in their desktop communications. 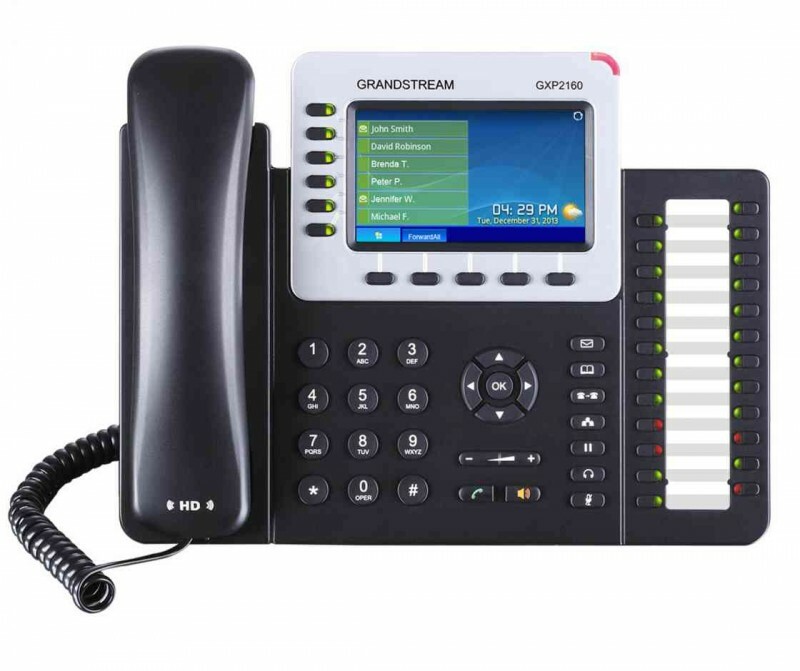 The GXP2160 is a Linux-based device with 6 lines, 5 XML programmable soft keys for customization and 5-way voice conferencing to keep business users in-touch. HD audio and a 4.3" color LCD screen create high quality calls, the built-on 24 BLF/speed-dial keys allow users to easily monitor presence and status of other extensions and transfer calls. Built-in Bluetooth support allows for use of Bluetooth headsets and transferring of phonebook and calls from paired mobile devices. This Enterprise IP phone also features Electronic Hook Switch support for Plantronics headsets and a built-in USB port. The GXP2160 is perfect for Enterprise & SMB customers with the need for quality and versatility in their desktop communications. The GXV3240 IP Video Phone for Android™ delivers a powerful voice, video and multimedia business communications experience to keep workers in-touch and up-to-date. 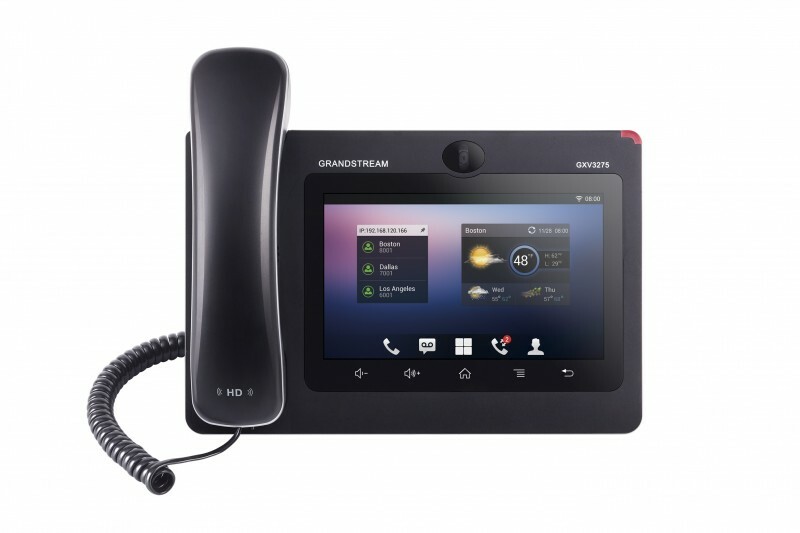 This one-of-a-kind 6-line IP phone features a 4.3 inch touch screen and, in addition to voice calls, allows users to keep in touch with co-workers and clients through a variety of video calling platforms (Grandstream’s free IPVideoTalk service in addition to any Android app, such as Skype, Google Hangouts, and more). This IP Video Phone for Android offers full access to the Google Play Store and the millions of Android apps – including powerful business productivity apps like SalesForce1, GoToMeeting, service provider apps and more. Additional features include integrated Bluetooth for pairing of headset and mobile devices for contact book/calendar exchange and call transferring, Gigabit ports, integrated WiFi and more. In addition to its value as an IP voice and video phone, the GXV3240 is also a great addition to any IP surveillance or door access solution. Pair it with third party door phones, SIP door openers or IP cameras to allow users to control these third-party devices in an office or apartment right from the GXV3240. From a surveillance standpoint, the GXV3275 can make and receive SIP video calls from IP surveillance cameras for security alerts/alarms or for checking a camera's live video feed. The GXV3275 Video IP Phone for Android™ combines a 6-line IP video phone with a multi-platform video conferencing solution and the functionality of an Android tablet to offer an all-in-one communications solution. The GXV3275 runs the Android Operating System and therefore offers full access to the many Android apps in the Google Play Store™, including popular productivity and business apps.